Has anyone ever used this wood in a project? -- Phillip -- Molino,Florida "I didn't cut it too short, I'm just making changes!" I haven’t. I guess the Chinese are keeping it all to themselves. I haven’t, but want to get some. It is light like balsa, but stronger. I haven’t either, but have wanted to as well. I do know of a few Paulownia trees around town though! First I’ve heard of this. It seems a bit expensive. We cut down a Paulownia tree in our garden about two years ago. I harvested the trunk. It dries rapidly and presents as a very light coloured and low mass wood, much like Balsa. In the East it is prized as timber for furniture (it is a hardwood), but I think that I would draw the line at boxes. It is also prized for boxes for tools, such as chisels. I have since built a few boxes in Paulownia. It was not fun. The wood is difficult to chisel cleanly, so I had to cut the dovetails a little wider than I liked. 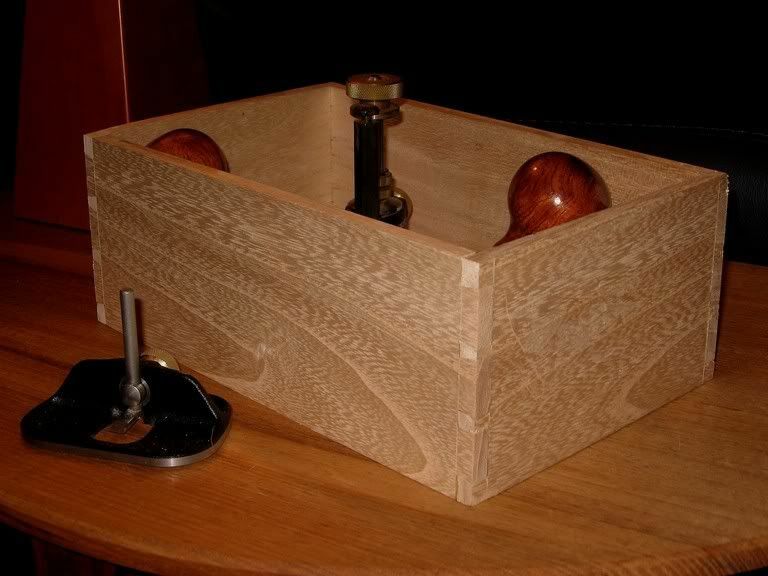 Here is one box, the pictue taken when it was still a WIP (taken when I was reviewing the Veritas small router plane). However, this shows up the grain quite nicely. Derek – When you harvested your tree, did it have a hole up the center of the trunk? Interesting that you posted about this wood. I’ve been reading about it and want to get some of it and try it. It is grown here in the US but it isn’t widely available. From everything I’ve read it is an amazing wood. It can be dried in less than a day from what I understand. There are some hardwood dealers that sell it. Just search on the net. It’s main growing region is the midwest. It grows incredibly fast and can reach good dimensional sizes for woodworking in just a few years after planting. When it is first growing its leaves are huge – 2-3’ in diameter but as the tree matures they become smaller and smaller. An amazing wood if there ever was one. I have a source here in town that has about 40,000 bf of it. He gave me some to play around with, but this stuff has a void in the heartwood that is natural. It looks like a giant wood boring bee has had his way with it. I can’t find anything online that describes the “paulownia” having this void in the center of the trunk though. From what I’ve seen so far, I would have to agree with Derek about sticking to boxes and such. Kinda like pine, you can look at it real hard and dent it. Well, finally getting to work with paulownia, started today. My ten dollar Borg backsaw is not appropriate- if I’m going to work more than a little with this wood I’ll need a saw with more sharp small teeth, a proper dovetail saw. The wood is pretty spongey and crumbly, kind of like if you had mdf made from balsa wood. But it’s easier to chop tight joinery than I’d expected. I’ll see how the piece comes out, making a small bookshelf kind of thing (couple of boxes stuck together, really). Going to have to put some kind of thick finish on it. I’m betting that Japanese paulownia furniture is usually lacquered- as you guys say, it dents very easily. I’ve used paulownia on a few projects. I love the grain and weight – it’s a bit of an ego boost to be able to toss around really large boards like that. The only things I don’t care for are the softness (easy to dent) and the silica content (it can be tough to sand and on tooling). I have noticed unusually large pithy centers in a decent % of the boards. Unlike many other species, it’s more of a circular void than a split. One time, we chopped up some really wide boards and the yield was horrible. Going back through the cut-offs it was obvious that large voids were hiding in the interior of of the board. Odd. On a side note, we once found a Paulownia board that bore an uncanny resemblance to Homer Simpson, so I snapped a picture. Yes, I have used Paulownia. It was back in the 1950s when I was building model airplanes as a kid. I loved building the rubber powered models and Paulownia was the much preferred wood to carve propellers from. I looked into it recently and found it difficult to locate and very expensive when you did. Curious as it grows as a weed bush/tree here in the South. I even have to cut them down periodically in my back yard. Once the roots are established, you can continuously cut them down and a new tree will sprout from the stump. There are some Paulownia tree farms here in Georgia. The wood is valued by the Japanese for their traditional clog footwear.